Bathers provided a range of services in early modern Europe. They administered water and steam baths and served as hairdressers to clients of municipally owned bathhouses. Beyond that, they performed surgical operations and blood-lettings, and also applied leeches, as can be seen in below. The scene takes place in a bathhouse, and the rhyming caption likens life to a hot bath – specifically one that makes the pious person sweat and fret. But the caption assures the reader that God’s grace “consoles and cools” in the end. 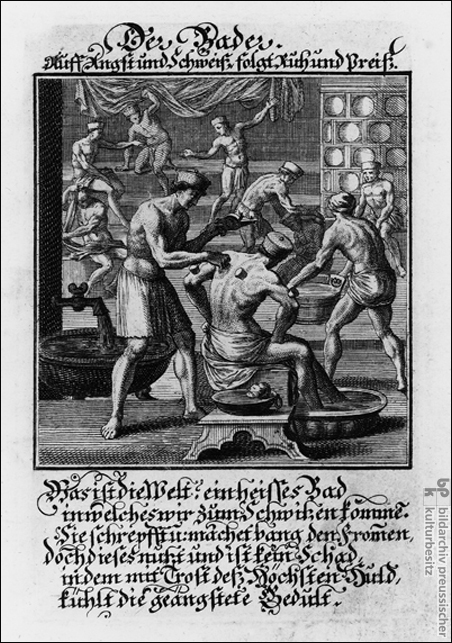 In the seventeenth century, the clergy and the rising class of medical physicians (the barber-surgeons’ rivals) increasingly condemned bathhouses for reasons of both morality and hygiene. The emergence of spas with hot springs in the eighteenth century contributed to the sharp and irreversible decline of the bathhouse. Copperplate engraving by Johann Christoph Weigel (after 1654-1726) from his Abbildung der Gemein-Nützlichen Haupt-Stände (Regensburg) with verses from Abraham a Sancta Clara (1644-1709), 1698.